This vulnerability is caused by the lack of sanitization of user-provided data in versions below 2.2.0. An attacker (with at least a subscriber account) could leak sensitive data, and in certain configurations, could compromise your entire WordPress installation. Please note that this is easily exploited in servers running MySQL versions before 5.7. The interesting part of this vulnerability – and the reason we wanted to generate this security advisory – is that free “user registration” is usually enabled on sites using this plugin in order to allow user preferences (i.e. wish lists) to be stored and accessible for later use. 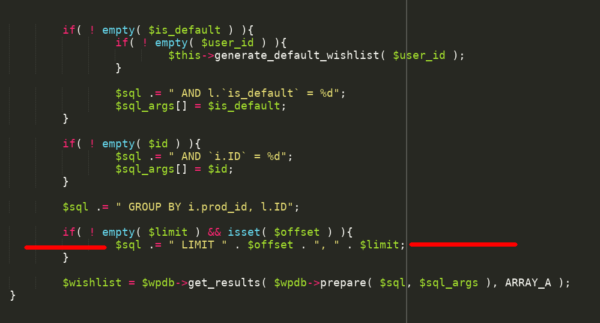 If attackers are able to set arbitrary values for the variable $limit they can modify the query in a way that can lead to a full compromise in several servers out there. One should not underestimate what can be done with an SQLi, nor how many servers allow attackers to get more than just encrypted hashes and user emails. 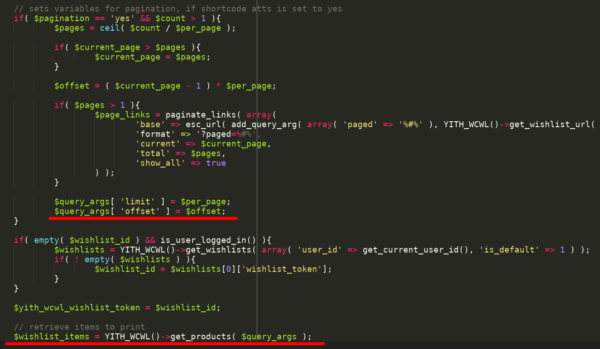 The only thing an attacker needs to do at this point, is create a user account and call the vulnerable shortcode as we described before in some of our posts. If you’re using a vulnerable version of this plugin, update as soon as possible to version 2.2.0!